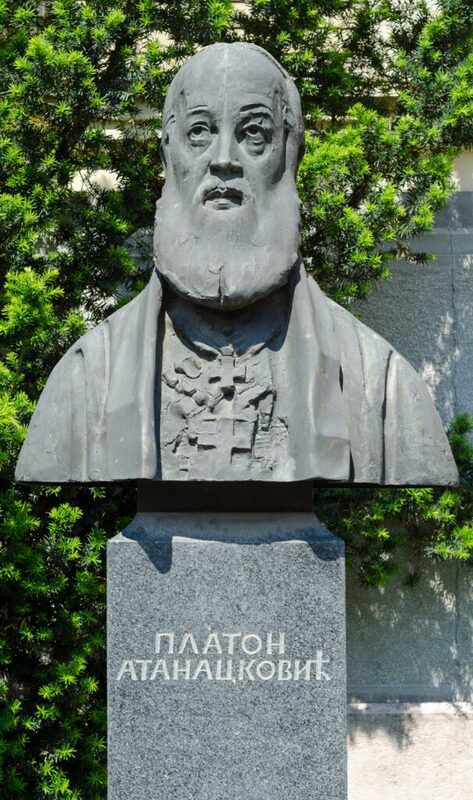 Platon Atanackovic (1788-1867) was president of Matica Srpska and a bishop of Backa territory. He was involved in writing, politics and humanitarian work. He worked for 70 years as a professor in Szentendre, Hungary. In 1829, became a monk in the monastery Krusedol, after his wife died. Soon, he became abbot, and then Archimandrite. He became in 1839 bishop of the Budim. Back then, he got transferred to the state government in Backa Diocese. Much is done for education and promotion of culture in the nation. He helped financially to establish the Serbian Law Academy in Novi Sad, he founded the fund in Sombor for the education of poor students of Teachers’ School, assisted the National Theatre. Platon (secular name Paul) has released over 40 literary works, the most important: “Prinos rodoljubivih mislej na žertvenik narodnoga napretka”, “Dijetalne besede”, ” Povjest rezidencije episkopa budimskago”, “Pedagogika”, “Metodika”. His bust is in front of the Matica Srpska since 1976. It was made of bronze, with the pedestal of marble, by the Belgrade sculptor Nebojsa Mitric. It is 210 cm high.